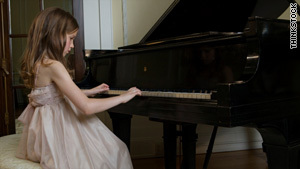 One poet wrote about her mother's struggles to ensure that her child got piano lessons. Robert Louis Stevenson: Poem tells mother to hear "The little feet along the floor"
(Mother Nature Network) -- Mother's Day poems come in all shapes and sizes. Many address the poet's memories of his mother. Others describe the poet's gratitude for his mother. Some are very short. Some are very long. Sometimes the mother-child relationship is complicated and the poet discusses the good times along with the bad. Other times, it's a straightforward message of love and gratitude. If nothing else, the poet almost always acknowledges the significant role a mother plays in the lives of her children. Needless-to-say, with Mom being portrayed so many different ways in poetry, there are several avenues for approaching a selection of poems appropriate for Mother's Day. The Scottish poet evokes childhood memories in this four-line ode to Mom. It appeared "A Child's Garden of Verses," a collection of 65 poems by Stevenson first published in 1885 under the title "Penny Whistles." The little feet along the floor. Ginsberg, one of the leading voices of the Beat Generation, wrote this lengthy poem following the 1956 death of his mother. It was published as part of a collection, "Kaddish and Other Poems: 1958-1960." Its title refers to the traditional Jewish prayer recited during times of mourning. Wakoski, a contemporary poet who counts Allen Ginsberg among her influences, writes of the "beauty that can come from even an ugly past" in this poem that recounts, among other things, the financial struggles her mother accepted in order to make sure she could pay for her child's piano lessons. Mother o' mine, O mother o' mine! This lesser-known piece by the Harlem Renaissance writer takes the perspective of the mother speaking to her son and telling him that "Life for me ain't been no crystal stair." It can be found in "The Collected Poems of Langston Hughes." Kasdorf is the second contemporary poet on our list. She talks about how her mother taught her to comfort those in mourning, to offer healing and "the blessing of your voice, your chaste touch." Do you have a favorite Mother's Day poem? Let us know in the comments below.